Andrew Norton introduces our new five-year strategy, which sets out IIED's response to the critical challenges of our time – and how we intend to work for a fairer future for all. 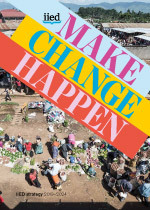 ‘Make Change Happen’ is our response to what we see as the critical challenges of our time: the crisis of climate change, felt around the world but most strongly by low income countries and communities; an increasing assault on the natural world; rising risks from rapidly growing cities; and markets that are not delivering benefits for people and the environment. With our partners we will act to influence change at every level. We will help vulnerable communities to develop and become climate resilient, while pushing hard for urgent reductions in greenhouse gas emissions through our partnership in the global climate negotiations with the least developed countries. We will promote biodiversity alongside social justice, making sure the women and men whose livelihoods depend on the precious resources of the natural world – on land and in the ocean – are heard, and their rights protected. We will work with partners to shape inclusive, healthy and sustainable towns and cities in the countries of Africa and Asia where the bulk of the urban growth of the next decade will occur. We will work to shape fairer markets, whether they involve big business or the dynamic micro-entrepreneurs of the informal sector making up the majority of the workforce in most countries. Underlying all of this is a concern to promote social and environmental justice, as a world growing ever more unequal cannot offer a sustainable future. Acknowledging the pivotal nature of Sustainable Development Goal 5, we’ll work to integrate gender equality and women’s empowerment throughout our research, using them as a framing for transformation and a starting point for addressing other causes of marginalisation. There will be renewed focus on important issues. We’ll develop our work to create the conditions for a thriving future for artisanal fishing communities, supporting the least developed countries in ocean governance negotiations and highlighting the effect that over-exploitation of the high seas can have on the coastal ecosystems upon which millions of people depend. We will strive to find effective ways of getting ‘money where it matters’ – to the communities at the frontline of the climate crisis. We’ll apply our expertise and experience in places such as the African drylands, urban informal settlements and with forest communities worldwide. And we will adapt to a changing political landscape by engaging with social movements and activists to drive positive change. We will be louder and bolder, taking an ambitious approach to engagement and listening – building our communities, strengthening current relationships, creating new connections, increasing media presence, sharing what we know – all with a view to making a difference on issues that matter. We’ll assess progress across our work using a newly-created Learning and Impact Framework, sharing lessons of success and failure alike to strengthen our ability for influencing change. We developed the strategy through a process of analysis, listening, dialogue with partners and critical friends, and through reflection. Pursuing yet greater excellence in our research through enhanced collaboration with outstanding institutions in the countries where we work. The last couple of years have not delivered on the promise of 2015, and the vision the world outlined in the Paris Agreement and the Sustainable Development Goals. We face unprecedented crises in the accelerating disruption to the Earth’s climate, the natural world and the lives of the most vulnerable people. This strategy outlines the ways in which IIED will respond and the areas in which we intend to make a difference. We hope you will look at what is presented here and join with us to make the change we need a reality, so, together, we can start to turn the tide.